March 23, 2012, 9:50 a.m.
Plus: A change in the New York Times’ pay plan, copyright problems for Pinterest, and the rest of this week’s media and tech news. By Mark Coddington @markcoddington March 23, 2012, 9:50 a.m. The agony and the ecstasy of Mike Daisey: The story that dominated this week broke last Friday, when This American Life announced it would retract a January story about abuses in Apple’s factories in China. 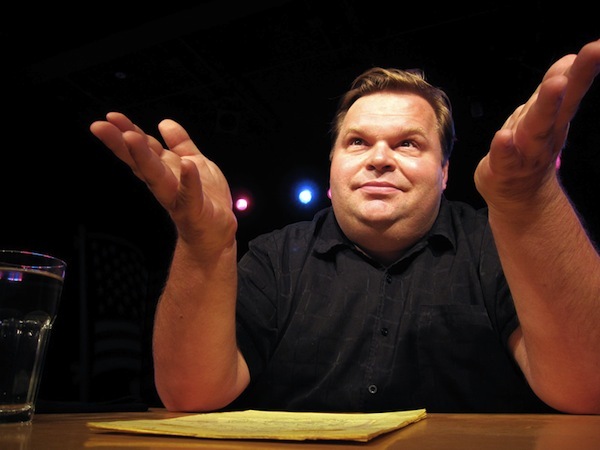 The piece, adapted from a monologue performance by Mike Daisey, turned out to be littered with falsehoods, which were discovered by a reporter for Marketplace and subsequently admitted by Daisey. (As it turned out, Gawker’s Adrian Chen had already been partway down this road, too.) TAL devoted a full episode to the retraction, and the resulting outrage led Daisey to change his show…but not that much. Daisey’s response was far more defensive than contrite. His initial statement contended that his only regret was to let a theatrical monologue air on a journalistic program. A follow-up lamented that people were using this controversy as an excuse to deny the reality of where their gadgets come from. You can also hear his prologue from one of last weekend’s shows, as well as a much longer defense of his story (helpfully transcribed here). Daisey’s response — not to mention his lying in the first place — wasn’t received well. NYU professor Jay Rosen called it the response of a “master manipulator,” and several others objected to his contention that he wasn’t bound to a strict definition of truth because he’s in theater, not journalism. CUNY professor Jeff Jarvis said truth is the norm for everyone, and Grist’s Scott Rosenberg argued that Daisey drew a bright line between journalism and theater (and journalism and activism) that doesn’t exist. Blogger Rachel Joy Larris contended that Daisey was aping the practice of journalism to give his stories a veneer of credibility. Several commentators delved into the possible reasons for Daisey’s fabrications: Reuters’ Felix Salmon said that it stemmed from a desire to turn a complicated reality into a simple narrative with clear good guys and bad guys; The New Yorker’s Evan Osnos posited that Daisey believed that China was too faraway and exotic to be fact-checked. Two other bloggers, Matthew Baldwin and Aaron Bady, said Daisey’s main problem was his narcissistic need to put himself at the center of his stories, and Arik Hesseldahl of All Things D refuted Daisey’s assertion that he was the only one shining a light on these abuses. An Economist blogger highlighted the role that Daisey’s misguided effort to blame the media for its supposed oversight played in his falsehoods and his defense. Daisey did have a few defenders—entrepreneur Kevin Slavin, Apple co-founder Steve Wozniak, and columnist Michael Wolff, who argued that journalists’ preoccupation with factual diligence neglects the fact that good writing is what audiences value. Additionally, others, included these professors writing at CNN, were worried that Daisey’s lies would distract from the larger truth of problems in Apple’s factories in China. Time’s James Poniewozik offered a similar “larger truth” point, but pinned the blame solely on Daisey — because of his lying, other well-reported accounts of abuses will be tarred by the “larger truth” of Daisey’s exposure. Others had different problems with the “larger truth” argument by Daisey and his defenders: Slate’s Daniel Engber said Daisey’s story wasn’t even substantially true, and Gawker’s John Cook described the “larger truth” argument as an artful attempt to get around the simple fact that “those things didn’t actually happen.” And Slate’s Jason Zinoman said the “larger truth” has already been reported by numerous outlets; the only thing Daisey added to those stories were precisely the things he made up. Also at Poynter, Steve Myers and Craig Silverman presented some lingering questions about TAL’s standards and fact-checking processes, and here at the Lab, Ken Doctor suggested that the solution isn’t to try to erecting higher walls between journalism and everything else, but to acknowledge and disclose the blurring boundaries that come with digital media convergence. Ceding ground in news to the tech Goliaths: Pew’s Project for Excellence in Journalism released its annual State of the Media report this week, and its overview lays out the themes pretty well: Mobile media consumption has come of age, a handful of tech giants are taking the lion’s share of the economic benefits as they fight to gain jurisdiction over more of our online lives, and the decline of traditional media continues to take its toll, financially and civically. Jeff Sonderman of Poynter also has a good summary of some of the other findings, especially as media consumption is concerned. One area that got some attention was on Facebook and Twitter use for news, which found that only 9 percent of American adults get their news often from Facebook and Twitter recommendations. Peter Kafka of All Things D interpreted the findings to mean that even though social media is much further along as a news source than it was just a few years ago, it’s still on the early-adopter curve. PaidContent’s Staci Kramer pointed out a few other social media findings that make sense — Twitter users are more likely to follow links from news sources and news recommendations from non-news sources, and they’re more likely not to know where a news recommendation comes from. And GigaOM’s Mathew Ingram saw a larger trend of personalized curation and aggregation, in which platforms like Facebook are becoming major players — and “frenemies” of news orgs. The Lab’s Adrienne LaFrance focused on who’s getting the money in this scramble for mobile and digital news dominance, and landed on the tech giants, pointing out that five tech companies (not including Apple and Amazon) received 68 percent of all digital ad revenue last year. She talked to the project’s Amy Mitchell about the prospect that one of those companies could swoop in to take over a struggling news org and the idea that “technology leaders might identify news production as a path to omnipresence in consumers’ lives.” Poynter’s Rick Edmonds looked at the way this is hitting newspapers, warning that they’re close the edge of losing a critical mass of advertising revenue. The Times’ pay plan tightens up: It’s been a year now since the New York Times launched its paid-content plan, and Joe Pompeo of Capital New York detailed its inception and its success: More subscribers than the paper anticipated and the same overall web audience, though slightly lower traffic. He also touched on the Times’ plans for the paywall going forward, including its attempts to grow internationally and to convert more casual readers to subscribers, partly through tablets. 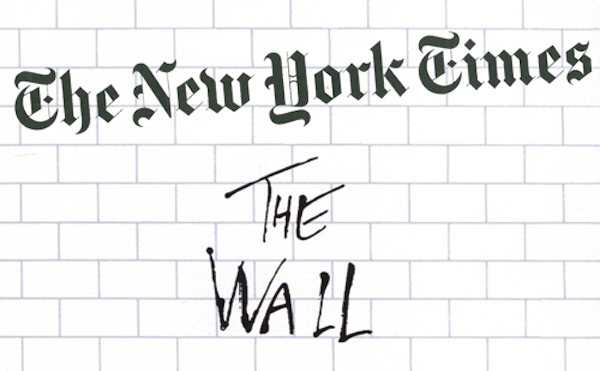 The Times unveiled the next step in its paywall development the next morning, announcing that it would drop the number of free articles per month before the wall kicks in from 20 to 10. (You can still get Times articles after you hit the wall by finding them through blogs, social media and, to a lesser extent, search.) Peter Kafka of All Things D wondered whether the Times was making the change simply because it could or because it had to. The Times also announced a total of 454,000 digital subscribers, which, as Pompeo reported, is well on its way to the 600,000 to 1 million it may ultimately need to be a success. The Columbia Journalism Review’s Ryan Chittum was impressed by the number of subscriptions, but he suggested that the Times might be able to rope in a few more younger readers by tightening the loopholes to its system. — Fortune was the latest media outlet to cover Pinterest’s meteoric rise, but some real warts are emerging: More attention is being drawn to its copyright problems from people like artist Glendon Mellow and the photographers’ group Artists’ Bill of Rights. Pinterest has assured that it’s addressing copyright issues. MediaShift, meanwhile, showed how j-school profs are using Pinterest in their classes. — On one side of media utopian/dystopian divide, Sasha Frere-Jones of the New Yorker offered a fine rebuttal to the argument that Twitter inhibits deep thought and serious argument. — Finally, the Lab’s Andrew Phelps put together a smart analysis of Gawker’s new editorial strategy of alternating “traffic-whoring” with more substantive posts. POSTED March 23, 2012, 9:50 a.m.
Coddington, Mark. "This Week in Review: Mike Daisey and truth in journalism, and the tech giants’ news grab." Nieman Journalism Lab. Nieman Foundation for Journalism at Harvard, 23 Mar. 2012. Web. 19 Apr. 2019. Coddington, Mark. "This Week in Review: Mike Daisey and truth in journalism, and the tech giants’ news grab." Nieman Journalism Lab. Last modified March 23, 2012. Accessed April 19, 2019. https://www.niemanlab.org/2012/03/this-week-in-review-mike-daisey-and-truth-in-journalism-and-the-tech-giants-news-grab/.